Part of the electrical equipment on the eighth floor that was destroyed by the fire. 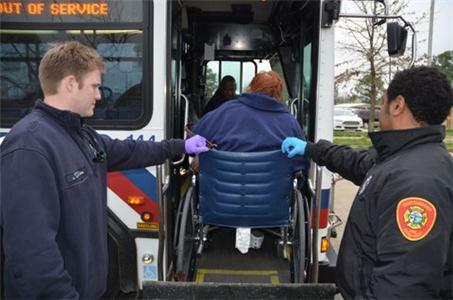 Senior Firefighter Larry Olivier (left) and Firefighter David Ruffin (right) help a disabled resident board a CARTA bus Monday afternoon for transport to the shelter. Another resident from Jaycee Towers arrived Monday afternoon at the Red Cross shelter. More than half of the 150 residents at Jaycee Towers stayed overnight at the shelter operated by the American Red Cross of Southeast Tennessee. 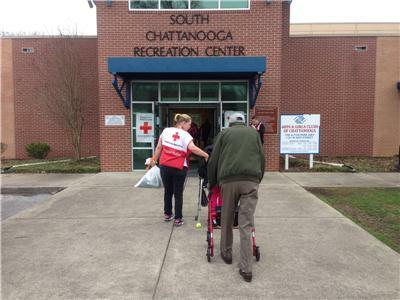 The shelter was set up at the South Chattanooga Recreation Center on W. 40th Street Monday afternoon after it was discovered that repairing the damage from the electrical fire would take 36 to 72 hours to complete. 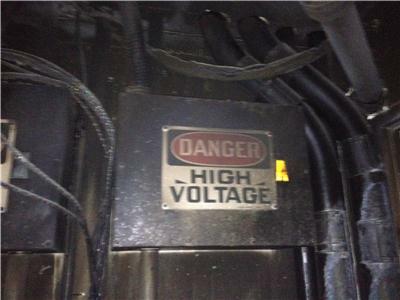 That estimate was provided by EPB technicians. Red Cross Executive Director Greg Waite said Tuesday morning that 82 residents, many of them with physical disabilities and other special needs, stayed overnight at the shelter. The Red Cross had volunteers and trained nurses to care for the residents, and the Chattanooga Salvation Army provided dinner for everyone. Through breakfast Tuesday, The Salvation Army had served 243 meals, 322 snacks and 318 drinks, and will serve lunch and dinner on Tuesday at the South Side Recreation Center. 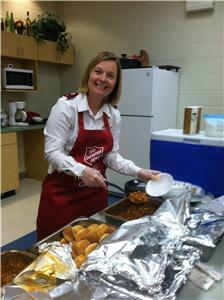 Kimberly George, Salvation Army incident commander, said, "We would like to thank our volunteers and our partnering agencies. 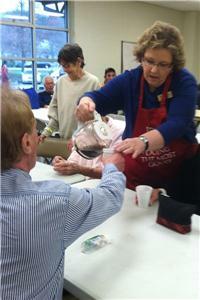 Together we are 'doing the most good' to meet the needs of the displaced residents." Representatives from the Chattanooga Fire Marshal’s office will be visiting Jaycee Towers Tuesday and will conduct a complete fire and life safety inspection to ensure the building is safe for the occupants once the repairs are made and power has been restored to the 18-story building.